Posted December 10, 2014 by finnfemme & filed under Daily Life, Frugal Living, Health, Vintage. It’s that time of year again when I have to turn to drying my laundry indoors. Gone are the summer days where I could just hang a load out on the clothesline and have it be dry in a few hours. Nope, the slow method is the way to dry for the duration of winter around my house. However, there are a couple of benefits of air-drying your laundry indoors. Yes, I do find it a bit annoying to have drying racks all around the house (I can’t tell you how many times I bump into or have to move the full racks). But it does have the advantage of releasing clean, moist air into your home. This evaporation increases humidity, which can be lost when we keep the heat cranked up all winter long. Another good thing is that air-drying laundry smells fantastic, and it fills the house with a cozy, linen-y scent. Last but not least, slow drying your laundry saves you a lot of money in utility bills. Your clothes dryer is one of the biggest vampire-sucking energy users out there, plus the risk of a dryer fire is high. 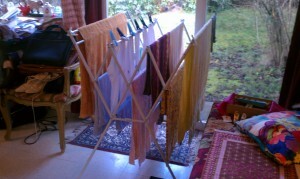 Just set your wet clothes on a rack and go on your merry way – no fuss, no muss. I like your blog. Thanks for pointing out that this humidifies the air…we need it in our dry house. Do you have a recommendation for a portable clothes line for hotel rooms? 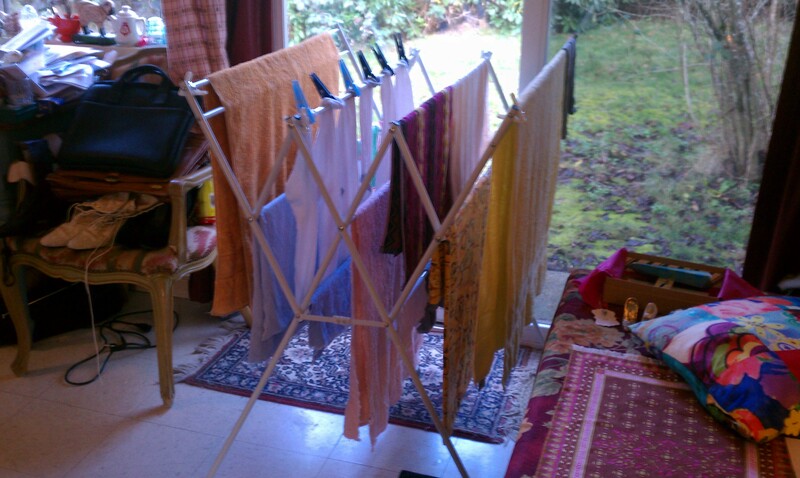 We always seem to need to dry something, & there aren’t good places to hang stuff. Perhaps I could string light items from the curtain rod…any ideas?